HBO’s hit show Silicon Valley returns with Season 3 soon so I decided to take a deeper look at the technology behind the notorious Pied Piper. If you watch the show then you’ll be familiar with terminology like algorithm, compression, and “middle-out” being thrown around pretty consistently without much explanation. While the show is technically very accurate and does capture the startup turmoil around the San Francisco Bay Area it’s still a television show that for the sake of dialog and plot lines takes some liberties with the actual product that is Pied Piper. For the most part Silicon Valley does a good job handling the technical jargon and believably of characters. Gilfoyle and Dinesh present legitimate technical issues as the developers and designers of Pied Piper and constantly banter about the best approach to take to solve said issues. But when it comes down to it, the characters don’t explicitly talk about what kind of a product Pied Piper is going to end up being. The vagueness surrounding Pied Piper is no doubt intentionally done by the show’s creators to keep techies intrigued just enough without giving away possible future plot lines. First, lets look at the facts presented by the show. In the first season Richard is a programmer who creates an algorithm for compressing music as a side project. At this point it’s mostly just back-end code that through command line can crunch music down similar to how MP3s are created. 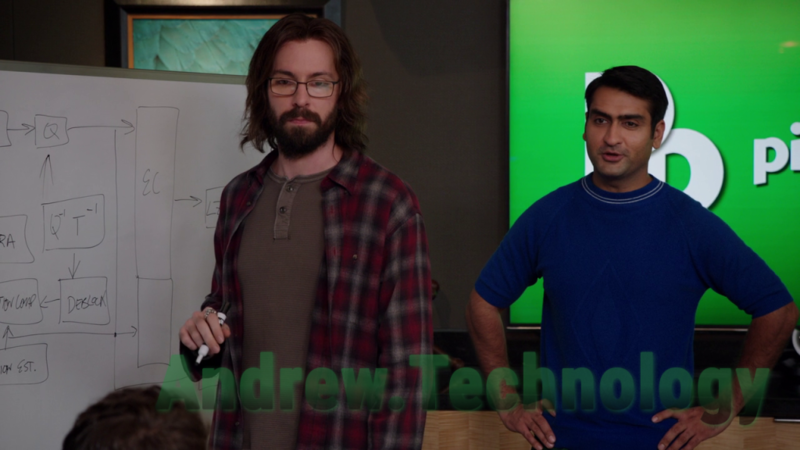 Eventually, Richard meets Erlich who incubates the startup and along with the help of Gilfoyle and Dinesh win the TechCrunch Disrupt with a record-breaking Weissman Score of 5.2 by pulling together an minimal viable product (MVP) of Pied Piper intended for music streaming. Besides the actual show the other official source of information comes directly from Pied Piper’s website, which is a real thing you can view for yourself here. The main tagline from the site is “A Middle-Out Compression Solution Making Data Storage Problems Smaller” which is prominently displayed below the logo. Then it has the question I’m trying to answer: “What is Pied Piper?” with some fluff answers about bloated corporations and being small and focused. But then the first real answer: “business-facing compression company” and then in even bigger words, “As such, we are in the process of deploying an integrated, multi-platform functionality of all applications of our algorithm”. Still vague but with some interesting clues. Let’s breakdown the wording presented from the website. Starting with “business-facing” that implies B2B (business-to-business) services which would no doubt be licensing the algorithm to other companies for their own use behind the scenes. But at the same time they talk about “multi-platform functionality” as if they are building their own consumer applications for iOS/Android/Windows users. Then there is the mystical “middle-out” which is simply a made up buzz word coined by a technical advisor to the show. Not surprisingly, Silicon Valley and the website present two conflicting narratives about Pied Piper. In one it’s a just a business facing coding algorithm that would be perfect for data/cloud storage. The other is a consumer focused application for streaming music and videos with great efficiency. Honestly, I don’t even think the creators really even know which it truly is. The Dark Zone is a lawless part of the The Division where players can find better loot, kill each other, or team up to fight higher level computer enemies. 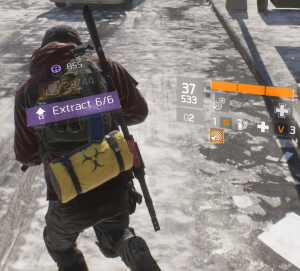 The higher level loot like blues and oranges are dropped by the harder non-player enemies and can be purchased by Dark Zone vendors using DZ Funds, the special DZ only currency that’s represented in purple with a capital R featured in the screenshot to the right. Besides the currency being different there is also a Rank system that is separate from your level. Gaining experience in the Dark Zone builds up this Rank just like the regular PvE parts of the world. Higher Rank lets you open crates found across the Dark Zone map as well as being able to buy and use loot from the Vendors. Lastly, there is a separate inventory for items and gear found in the Dark Zone that is limited to only six slots. When you pick up drops in the DZ it goes into this special loot pack that will show up on your Agent’s back. In the lore of the The Division these Dark Zone areas are still infected with the deadly virus and so that is why the DZ is quarantined from the rest of the map. Sticking true to this narrative, all the new gear you collect while in the Dark Zone is also infected and must be decontaminated before it’s used. To decontaminate you must extract the gear by calling down a helicopter and successfully attaching your loot pack before the count down timer runs out and the helicopter takes off for the Base of Operation. There are multiple entrances to this cut throat area and where you choose to enter can determine how close you are to different parts of the Dark Zone. For one, each entrance has a different vendor with different gear. Then there are Safe Rooms that let agents take a break from the possible PvP and of course buy things from a vendor here as well. Of course there are different non-player enemies that spawn at specific points and crates that can be opened with keys. Most importantly there are Extraction Areas that let you keep the new loot you find. On the Dark Zone map you’ll find a few Extraction Areas each with it’s own advantages and disadvantages in terms of cover, non-player enemies spawning and distance to a possible exit. These factors have to be taken into consideration because once you start an Extraction your agent will shoot a flare into the air and all agents in Dark Zone are notified you requested to extract. A count down timer will also be displayed with the time remaining until the helicopter arrives so other agents will know exactly when you’ll be the most vulnerable. 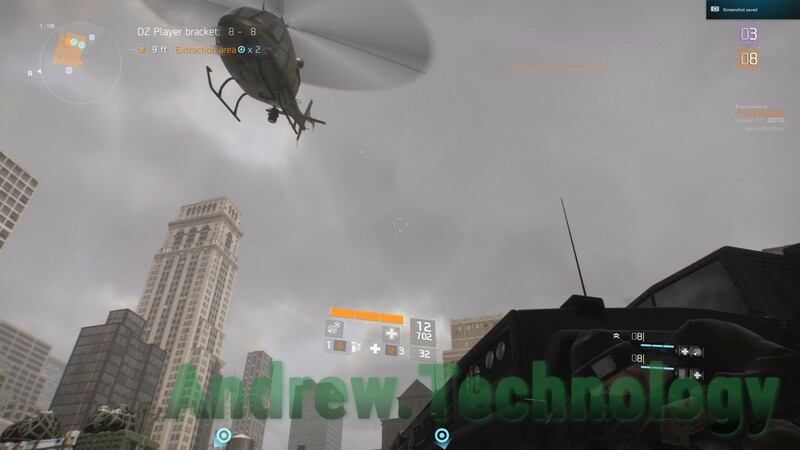 Once the helicopter has landed you’ve got about thirty seconds to get your loot bag attached before it takes off. It’s as simple as running up to the bottom of the helicopter and using the action key to attach to the cord. Of course if you get shot while running up to the helicopter or before successfully attaching then you might die and drop all the loot you were trying to rescue. It’s advisable to have a good party of players you trust for backup and feel comfortable with unknown agents around the area. It costs nothing to request an Extraction so don’t feel bad if you don’t get it on the first try. Some player’s even request an initial Execration as a decoy at one part of the map then run to another area to call another Execration there. 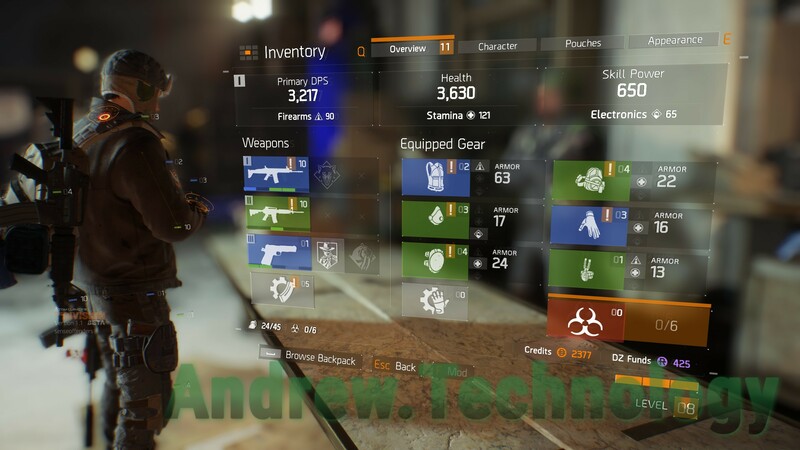 The Division lets you equip two normal sized guns and a sidearm (Weapons) along with body armor, mask, knee pads, backpack, gloves, and holster (Gear). Firearms, Stamina, and Electronics are Stats you get by leveling up and from equipped Gear which gives bonuses. Firearms increases the damage of your weapons, Stamina adds extra health, and Electronics gives you more skill power. This is all found in the Inventory menu under Overview. Guns can also be given additional bonuses with Mods which are dropped as loot. Speaking of loot, it’s the items dropped after killing hostile enemies in the world and found in chests, drawers, and other containers. Dropped loot is represented in game by a glowing pillar coming out of the ground. The color of the light pillar depends on the rarity of the item. The least rare items are white and from there it jumps up to blue and purple much like in MMOs. Walking over the light lets you view each item or pickup all of them. Loot is unique to each player in game so you only see loot on screen that is yours, everyone else loot is hidden. Basically, pick up all the loot you can because it’s all yours and you can carry quite a bit before your backpack fills up. Remember, even if you don’t want the stuff you can sell it to a Vendor later for Credits to buy items you do want. Once you pickup new guns or gear that can be equipped you’ll see an exclamation point (!) over those respective categories in the Overview menu. It’s not a statement of a better gun or gear just that you picked up new stuff and you should take a look. To do that you want to select a Weapon or Gear in the Overview menu like the primary weapon or body armor. Menus will show you the options you have to equip for that category with the stats and bonuses as well as comparisons to the equipped item with up or down arrows to indicated what Stats get bumped or lowered. Every item gives you different amounts of Firearms, Stamina, and Electronics Stats so you’ll need to equip different gear to suit the needs of your play style/build. All your Gear provides a certain amount of Armor as well that is used to protect your Agent. Lastly, Stats will unlock special Weapon Talents that give your guns additional bonuses as you get better Weapons. Besides the Overview menu there is also the Character, Pouches, and Appearance menus under the Inventory. Character and Pouches were locked in the Beta but Appearance controlled the cosmetic style of your Agent. You could swap jackets and hats to look different in game cosmetically but it does not actually provide any type of advantage. The game has three different paths to progress the plot in the normal player versus everyone zones that you start the game in. Missions are the main plot points of the game that are big instanced events. Madison Field Hospital and Subway Morgue were the two Missions in the Beta. Before starting a Mission it requires you to pick a difficulty. Normal is the default difficulty that generally allows you to solo with success. Hard difficulty requires a group of agents to tackle but if you need some team mates their is built in functionality to find a group as well. Entering a Mission creates a unique instance to your world that only you and your group are playing in so you can easily replay Missions on different difficulty to grind experience and get better loot. Side Quests have plots hooks into Missions but are optional. Encounters involve the street and adjacent buildings usually where you help out a person by taking down a gang, finding a key, and unlocking a door for an innocent civilian. You can replay Side Quests as well. If you restart your game or join a new group all your Side Quests should be reset on the map so you can them again. Firearms, Stamina, and Electronics each have different skills to level up known as Medical, Tech, and Security. As you progress through the main Missions you start upgrading the Base of Operation and thus giving you better skills. You start off with one skill slot that lets you assign a single skill and then you’ll be able to unlock more slots. Medical skills provide healing with First Aid and heads up world scanning with Pulse. Tech skills give you extra offensive power with Turrets and Sticky bombs. Lastly Security skills give defensive with a Ballistic Shield and different Cover abilities. This weekend gamers got a taste of the upcoming The Division video game though a free open beta. 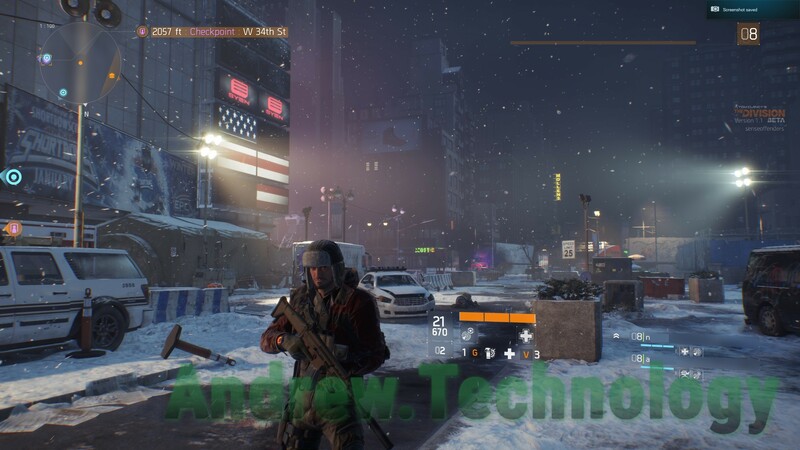 Tom Clancy’s The Division is a cover based third-person shooter set in the streets of Manhattan New York after a virus has wiped out most the population. Users play as special tactical agents helping rebuild and defend the pockets of society still left while collecting better guns, armor and skills. The game has role-playing elements and a massive multiplayer open world type architecture but I’d hesitate to label it an MMORPG. Ubisoft opened up servers for Xbox One on February 18 with PS4 and PC following the next day. Character customization was disabled and every agent started at level 4 with adequate gear to jump in and start playing the open beta. Much of the map was also marked off with limits to restrict agents movements to a only few neighbors and their was level cap of 8 in place. All of this was intentionally done by Ubisoft to not give away large plot points but still allow testing of select missions and the Dark Zone free-for-all. The Division, unlike many shooting based games, does not make you pick a class. Instead the game relies on Firearms, Stamina, and Electronics Stats that are influenced by the gear equipped and level. For example if you want more health then you need gear with more Stamina or if you want higher damage per second then the Firearms Stats is important. Stats also unlock Weapon Talents that allow for even more bonuses as you collect rarer guns. 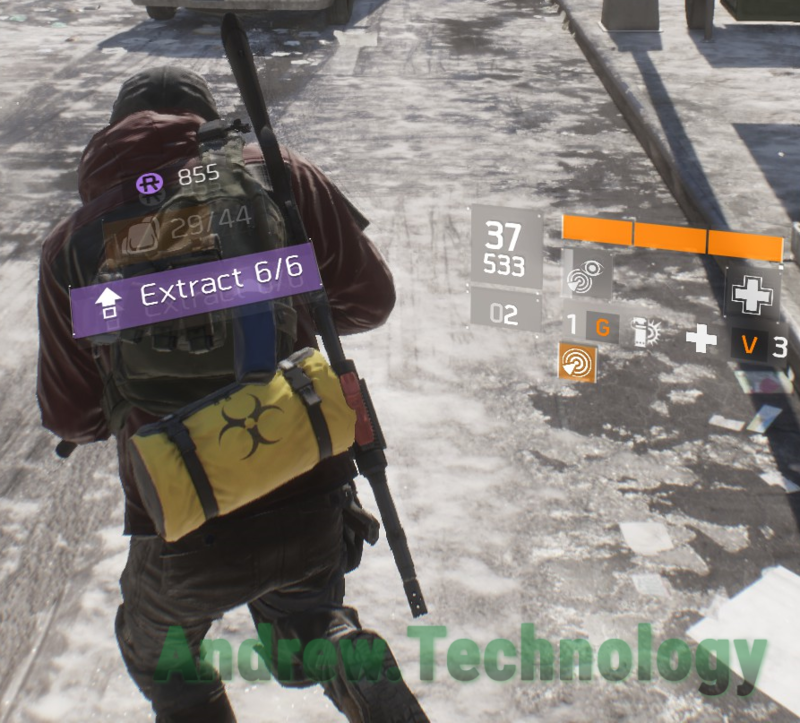 It’s difficult to articulate how much more important gear is in The Division because the lack of a class system. The gear you pick is essentially your agent’s build. Every item has a rarity based on color starting at white and going up to blue, purple and legendary. Honestly, I only found blue items when I played but users posted photos of purple items on reddit and it was later stated Dark Zone vendors were intentionally selling purple gear for the open beta. Valve’s annual Steam Winter Sale 2015 dubbed “North Pole Noir” ended January 4th after running for two weeks. Thousands of video games and DLC went on sale for the Winter Solstice holiday which started December 22nd. Unique trading cards were distributed though purchases and the new Discovery Queue with a comic book theme throughout. Each day Valve released a new page of the “North Pole Noir” comic which can still be viewed on it’s website. All 10,114 games on sale were at their lowest price through the entire two week duration following Valve’s new sale format introduced during the Summer Sale 2015 . No more voting for community choice games and no more flash sales this year and possibly never again. Instead users had to view (or skip through) their Discovery Queue up to three time a day to get Winter Sale cards for free, unlike past years that relied on voting for the free cards. It’s obvious Valve is trying to get new games in front of users eyes using this new Discovery Queue system. Discovery Queue algorithms pick out 12 games from the 10,000+ on sale for a user to mark as Follow, Not Interested, Add to your wishlist or Next in Queue to skip. 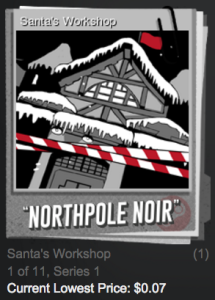 Going through all dozen picks adds a random “North Pole Noir” card to the users inventory which is used to craft the Winter Sale 2015 badge once all 11 were obtained. Of course users could sell or buy these cards using the Community Market if they lacked one or had duplicates. Personally, I received many duplicates by the end of the sale. I received five “Redemption” (#11) cards, four “Twinkle” (#4) and “Guess Who’s Coming to Town” (#10) cards, three “You Better Watch Out” (#3) cards, two “The Black Ice Boys” (#5) and a single card for “Santa’s Workshop” (#1), “Zippy’s Demise” (#2), “Holly” (#3), and “Sending a Message” (#6). I received no “You Better Not Cry” (#9) so I used the proceeds from selling duplicates to buy it. Most cards were selling for six to eight cents. Steam’s monthly Hardware & Software Survey shows Windows 10 is gaining big amongst gamers. The new operating system features the latest DirectX 12 graphics API so most of these gains also reflect in DirectX 12 adoption. From August to September Windows 10 64-bit gained 7.95% bringing it to 25.06% of the Windows install base on Steam. Windows 10 32-bit is just shy of 1% so all together Windows 10 accounts for 26% of Steam users reporting in the September hardware survey. Windows 7 64-bit is still holding strong at 39.16% only loosing a few percentage points between August and September. Windows 8.1 64-bit lost the most month-to-month at -4.93% finishing at 19.46% and third overall following Windows 10 64-bit. No doubt users are upgrading from Windows 8/8.1 to 10 at the faster rate among Windows versions. 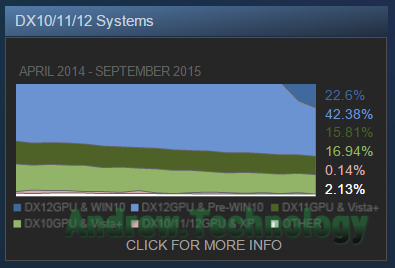 Valve provides a graph for DirectX 10/11/12 Versions but they don’t group that data the same in the tabular breakdown. Complicating the numbers is the fact you not only need Windows 10 but a compatible video card to utilize DirectX 12. According to their graph DirectX 12 GPU & Windows 10 accounts for 22.6% of users effectively the true indicator DirectX 12 among Steam hardware survey participants. DirectX 12 GPU & Pre-Windows 10 accounts for 42.38% so there is still quite a bit of room to grow. I compiled the Windows Version data into a graph to illustrate Windows 10 gains. Windows XP is black, Windows 7 (32 & 64-bit) are in red, Windows 8/8.1 (64-bit only) are green, and Windows 10 in blue (64-bit only). I only used versions that had over 1% market share for September so this excluded: Windows 10 32-bit (0.92%), Windows 8.1 32-bit (0.48%), Windows Vista 32 bit (0.37%), Windows 8 32 bit (0.22%), and Windows Vista 64 bit (0.19%). Last month at the XDC2015 conference AMD detailed plans for their Linux driver stack dubbed “AMDGPU”. At the center of AMDGPU is a new open-source Kernel driver that interfaces both closed and open source user-mode drivers (UMDs) unifying it’s driver offering into a solution that both official drivers and community created alternatives can tap into. 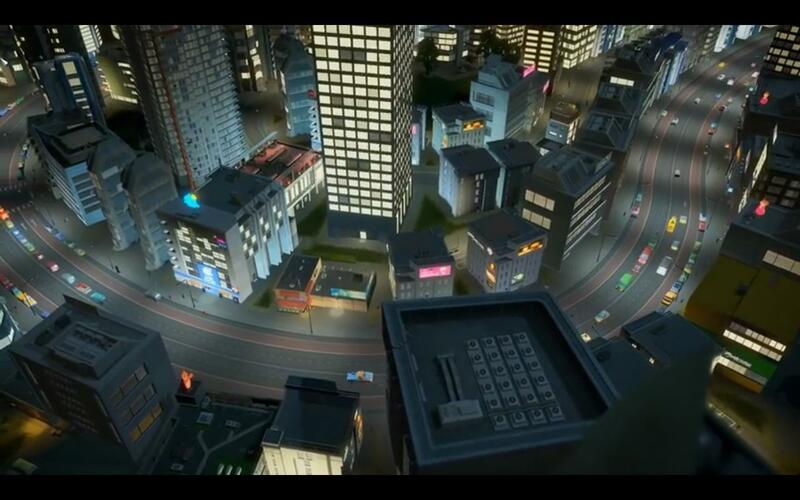 From the images displayed on your monitor all the way down to the physical hardware, the graphics driver stack controls every aspect of of rendering both 2D and 3D graphics on a computer. It’s important to differentiate between the Kernel graphics driver (AMDGPU) which is used by hardware and the user-space drivers which is used by the operating system (Linux). Since both closed and open source user-space drivers will utilize the same Kernel driver it will be possible to switch between user-spaces without the need to reboot! Using AMDGPU most of the graphics stack will be open-source including the KFD and HSA runtime, OpenGL, Video Encode/Decode Gallium, DDX and Advanced Micro Devices has promised to open up OpenCL and Vulkan as it progresses down the AMDGPU road map. They also showed a closed stack diagram for AMD FirePro that will remain proprietary for workstation graphics cards but these are mostly used at the enterprise level. This is a big deal for Linux users who for years had to choose between proprietary graphics drivers that offered better performance or open-source alternatives created by the community. For AMD cards, Radeon is the open source project that is based on documentation released by AMD and Catalyst Linux previously known as fglrx is the current official drivers. On the NVIDIA side of things, Nouveau is the open source project that relies almost entirely on reverse engineering and NVIDIA’s proprietary Linux Display Driver is what they officially recommend for Linux users. Support of this new driver does require owning a slightly newer AMD graphics card with GCN 1.2 support which are chips based on Tonga, Fiji, and Carrizo it’s new mobile-only chips. This does include the latest and greatest AMD Fiji cards: R9 Fury X, R9 Fury, and R9 Nano. Tonga cards supported only include the Radeon R9 285 and OEM only R9 380. All Carrizo APUs are supported but so far few have been announced or released. 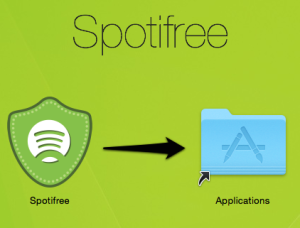 If you listen to Spotify Free on Mac OS X then you can easily run Spotifree to mute audio ads automatically. 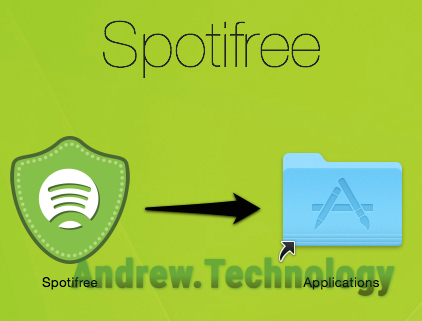 Spotifree is a tiny program designed to run at startup and live in the top menu bar as an icon with a dropdown menu. Every half second it asks Spotify for the URL of the current track, which is available as an API and determines if it’s a song or ad and mutes accordingly. This is a non-intrusive method so nothing is being hacked or changed on Spotify’s end just simply reading data and muting/unmuting based on it. Head over to the developer’s website to download the DMG bundle for Mac. Install through the usually OS X method of mounting the DMG and then drag the Spotifree icon into the Applications folder. Running Spotifree for the first time it will ask: “Do you want to run automatically on login?” which you should click OK to especially if you are running Spotify on startup as well. That’s it for the install, time to fire up Spotify and start listening to test it out. The Spotifree icon should be in the top menu bar near the Bluetooth, WiFi, Power icons in the top right of the Mac user interface. When you are listening to a song the icon will appear normal but the second an audio ad is playing the icon will have an X going through it to state it’s muting. If you clicked the icon a drop down gives you more information including the state of either “Spotify is playing” or “Muting an ad” and options to update, change settings or quit the program. 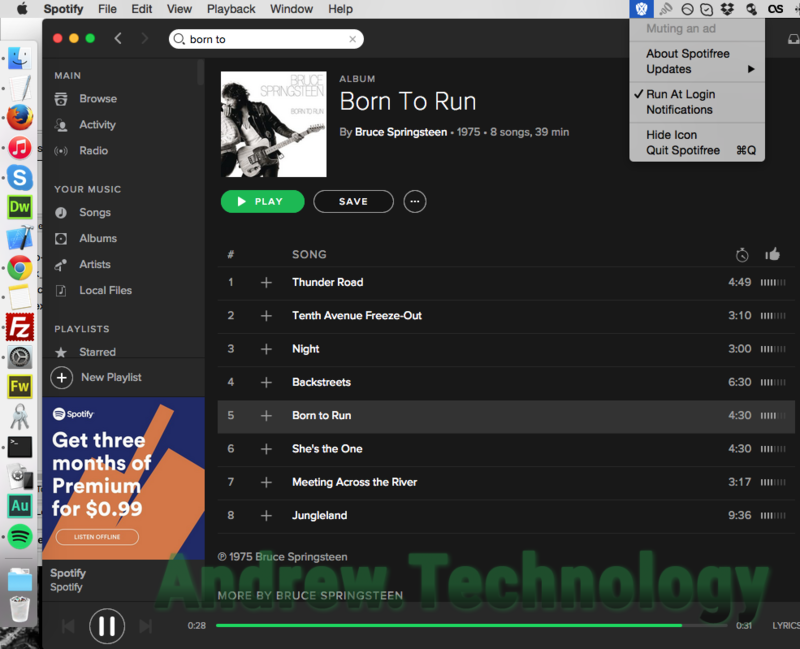 Mac OS X Spotifree: Do you want to run autmotically on login? I wrote about EZBlocker which does something similar on Window only a lot better since it’s able to block audio ads altogether sometimes and visual banner ads. Like EZBlocker though, this project is also on GitHub and licensed under the MIT License making it open-source software. This is a great thing because anyone can review the code or offer updates in the future! Spotifree cannot block video ads or mute them automatically right now. Also banner ads and graphic pop ups will not be blocked under this program. I tested over a period of time but at the time of writing this my Spotify was version 1.0.15.133.gf21970bd and I’m running Mac OS X 10.10.3 Yosemite. The team behind Cities: Skylines and upcoming expansion answered questions posed by the Reddit community on /r/IAmA/ yesterday. Topics ranged from in-game agent limits to the infamous death waves to the new expansion After Dark. 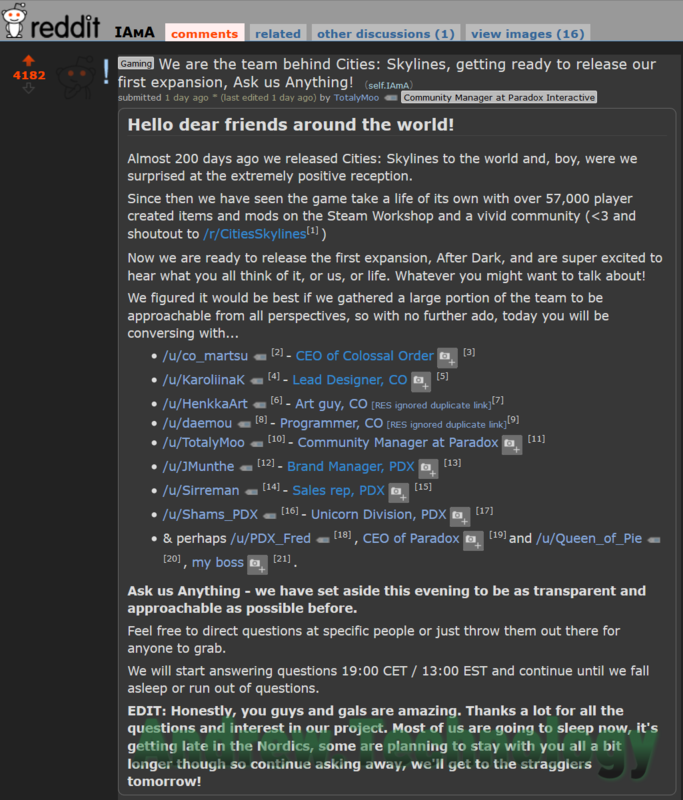 The post “We are the team behind Cities: Skylines, getting ready to release our first expansion, Ask us Anything!” is still going with Colossal Order and Paradox Interactive members still answering questions a few hours ago from the time of writing this. At close to 4,200 positive karma this makes it one of the most popular Ask me Anything (AmA) in the hot section of /r/IAmA/ at the moment. Developers Colossal Order have been very involved in the community and this is just another sign of their dedication to listening and answering the community’s questions. There is tons of great information in this post so I encourage you to read but I’ve also included some items I found interesting. I divided the comments and questions between general and Cities Skylines only and the new expansions After Dark. Answer: Pirates are fans like anyone else, they just haven’t been convinced to pay for our product yet. Lots of the people tweeting about us, posting on reddit or sharing our stuff on Facebook don’t legitimately own the game – that doesn’t mean they can’t contribute to the community or sales in a positive way. The lost sales we’ll see at launch are mostly going to be because we haven’t presented a good enough value proposition to these people (bar some that just can’t afford it or be bothered). So hopefully most piracy at launch will eventually be transferred into real purchases once these people feel convinced they want the game enough. Answer: First person multiplayer mod. I’m like – who even wants this? 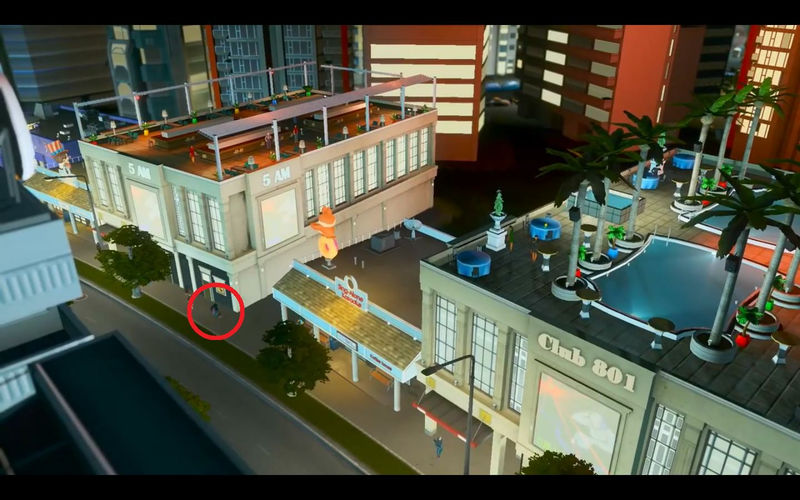 The game does look like a hulk simulator though – with all the jumping around.
. Are they in any way affilated with the ones from Traffic++? 2a: Is it possible to turn off street lights for one specific street, road type, or all roads? 2b: In some countries the street lights on highways will be turned off after midnight (between 0:00 and 6:00). Will that be possible to do in After Dark (would look very nice and realistic)? 3: Do street lights cost you money at night?
. Why the hell are those cyclists on the SIDEWALK? No sane Dutch person would ever cycle on the sidewalk when there’s an asphalted road next to it (except to take a shortcut). Cycling on the sidewalk here could cost you a fine of €45 (which is more than 3 times the price of After Dark)!
? No bicycle-friendly city would be complete without those red bicycle lanes. 6: Do we get something like London’s Boris Bikes (Bike docking stations, as a type of public transport) in the game? 7: What will parking cars do on road with a bicycle lane? will they disappear or will they try to park elsewhere? So many questions! I’ll try my best to answer! We do take inspiration from mods, but we would never just grab a mod and put it into the game. 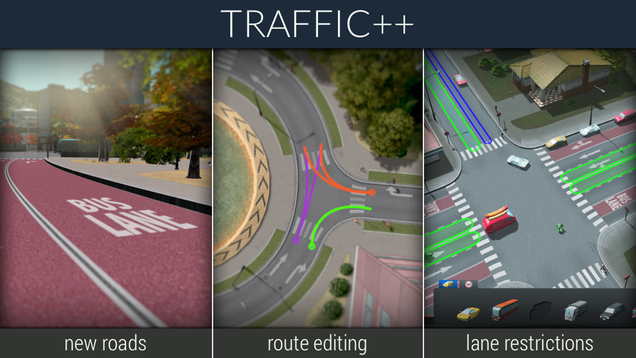 Traffic++ is a great mod and we have both taken very similar approach to bus lanes, hopefully because it’s the best way to do them. 2a and b. Nope, sorry! Putting cyclists on the sidewalk by default was mainly a techinical choice. We wanted to bring down the traffic intensity so putting them on the streets acting like cars would not have helped, and creating a whole new AI for cyclists driving beside cars would have taken too much time. There is a policy for banning cycling on sidewalks, so you can definitely tell the citizens not to do it! Yes! There are bike paths, that are separate pathways just for bikes, and bike lanes that you can have on roads. At this point no, sorry. Cars will park elsewhere or just disappear if there’s no space nearby. Computer system builders rejoice you can buy the Intel Core i7-6700K from Newegg & TigerDirect without a bundle or hassle. That’s right the allusive i7-6700K is in stock and available to purchase in the US! I recently wrote about the lack of them in the United States with a follow up talking about the bundle Newegg required, who at the time were the only major US computer parts retailers selling the chips. 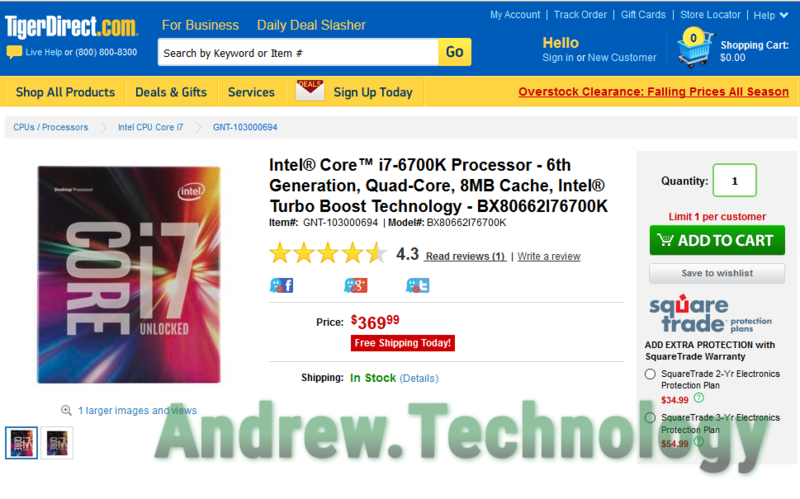 You can buy an Intel Core i7-6700K for $369.99 at both retailers at the time of writing this. This is good news for everyone interested in Intel’s new 6th Generation processors codename Skylake. Computer enthusiasts, architects and video editors are prime buyers for the high-end Intel Core i7-6700K 8M Skylake Quad-Core 4.0 GHz because it’s the the fastest 6th Generation chip released by Intel so far. The scarcity of Skylake i7 chips in the US had been driving prices up as well so more stock equals normalized prices. Both Newegg and TigerDirect are limiting purchase to 1 per customer at this time. At $369.99 it’s only $19.99 higher than the $350 MSRP for the i7-6700K which is the best price the United States has seen so far. If you had been waiting to build a new Skylake desktop or had bought a Z170 motherboard hoping to plop the i7-6700K into it once available then now is your chance!